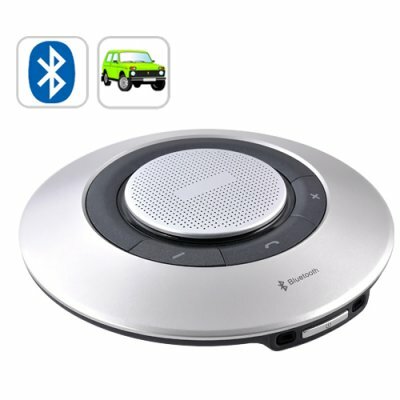 Successfully Added Bluetooth Handsfree Speaker - Car Speakerphone to your Shopping Cart. Handsfree car Bluetooth spekear! Drive with easy and comfort while taking calls. This handsfree speakerphone is designed to be the best portable speaker option for people often on the road. This bluetooth speaker can be mounted on your car's sun visor using the included mounting attachment, or you can easily place it in any desired location such as on your cars steering wheel, dash board etc, thanks to the included adhesive pad which allows it to stay in one place, in addition, this bluetooth car kit can be easily detached with a simple twist and taken out of the car for security. Used like a wireless bluetooth headset to make phone conversations easier and more convenient when you are on the road, and designed with a built-in voice recognition for taking a call, ending a call, rejecting a call and redial functions. This Bluetooth car handsfree speaker also comes with a long lasting built-in rechargeable battery for taking this speaker system on extra long road trips. This Blutooth car kit is not like your regular car bluetooth kits, this special bluetooth handsfree speaker phone, can also be use with your computer, such as VoIP over Skype, MSN, etc. Simply connect this bluetooth speaker to a Bluetooth enabled PC and use the device to make calls over internet using VoIP technology. This device is a truly excellent wireless calling solution. Key features of this unique Bluetooth car kit include. This Bluetooth Speaker has up to 10hrs of talk time and up to 450hrs of standby time with 10m of operating range. This Bluetooth speaker features a volume control and the last number redial function allowing you to easily dial up then number of the previous caller. This Bluetooth version 2.0 speaker is rechargeable and comes with a car charger and can be mounted on to the sun visor or dashboard of any car. This bluetooth car kit is brought to you an a low no MOQ (minimum quantity order) by the leading provider in direct china consumer electronics, Chinavasion. Thanks chinavasion, great service, fantastic product. I bought this for my husband as it is going to be illegal to use a mobile phone in the car in New Zealand, so this is the perfect solution and it works great.